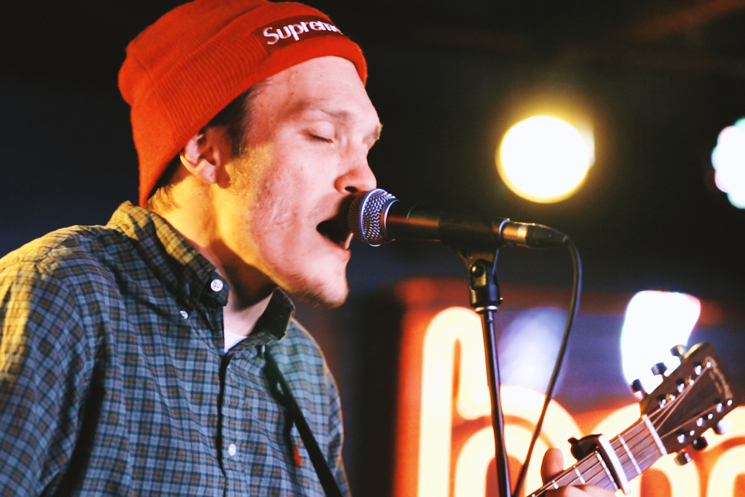 Wrexham, UK pop-punk fivesome Neck Deep recently made the long journey overseas to visit fans in North America, with the Canadian leg marking the beginning of a lengthy world tour. With a long four months of traveling ahead, we caught them in the midst of their busy schedule for a special three-song set for Exclaim! TV, right in the heart of Toronto, at the Yonge-Dundas HMV Underground. From worldwide tours to recording with their idol, A Day To Remember's Jeremy McKinnon, the years following the band's signing to the American label Hopeless have been nothing short of "a dream come true," according to the group. August 2015 saw Neck Deep release the hugely successful Life's Not Out to Get You, and their secret performance found them plucking a handful of tracks from the LP, as well as a fan-requested treat from 2013's A History of Bad Decisions, for the setlist. Reduced to a trio for the stripped-down session, the band kick off the set with their upbeat hometown anthem "Can't Kick Up The Roots" before upping the intimacy for the emotional-yet-optimistic pop-punk gem "Gold Steps." Finally, vocalist Ben Barlow picks up his own set of strings to make one fan's dreams come true with a heartfelt, acoustic rendition of oldie "Head to the Ground." Though the band played a show at the Opera House later that very evening, there was no shortage of energy at this cozy pre-show jam. Watch the band's exclusive performance in the player below.